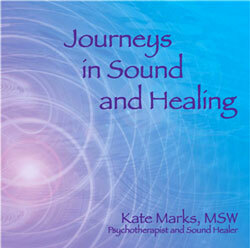 Kate has a collection of crystal healing bowls that she uses in her sound healing sessions, workshops, sacred circles, musical presentations and recordings. They are powerful tools for meditation, and recalibrating our energies on all levels – physical, emotional, mental, spiritual and etheric. Crystals are highest form of mineral life. They are conscious–made of carbon and silicon. Pure crystal bowls are the oldest. They were invented by the computer industry to grow silicon chips. Used in computers, they discovered that they had extraordinary sound qualities. They have no grain boundary which in scientific terms means there is no other molecule structure that gets in the way of their sound—the sound they emit is highly resonant for their size. Crystal bowls are made with pure rock crystal that has been crushed and heated to 4000 degrees. Some manufacturers combine and infuse the pure melted crystal after it cools with gemstones, minerals or metals such as amethyst, citrine, moldavite, kyanite, gold, and platinum. When a bowl is played, it sounds not only a musical tone, but also the frequency of the gems or minerals that have been used to create it. When multiple bowls are played together, the resulting frequencies are richly layered, and often we can hear tones that the individual bowls do not produce by themselves. The bowls have powerful overtones that resonate different intervals which can activate and attune us, as well as slow down our brain states and balance the nervous system. The bowls are especially effective in that they bypass our rational, logical, linear minds and resonate directly at a cellular level. They connect people to their bodies, emotions, sensations and subtle energies, creating a potent resonant sonic field which catalyzes deep release and healing. Many people who have come into a session with a variety of complaints find that without understanding why, they feel lighter, happier, calmer, more optimistic and at peace. Sound samples of the crystal singing bowls coming soon.